Color us proud! 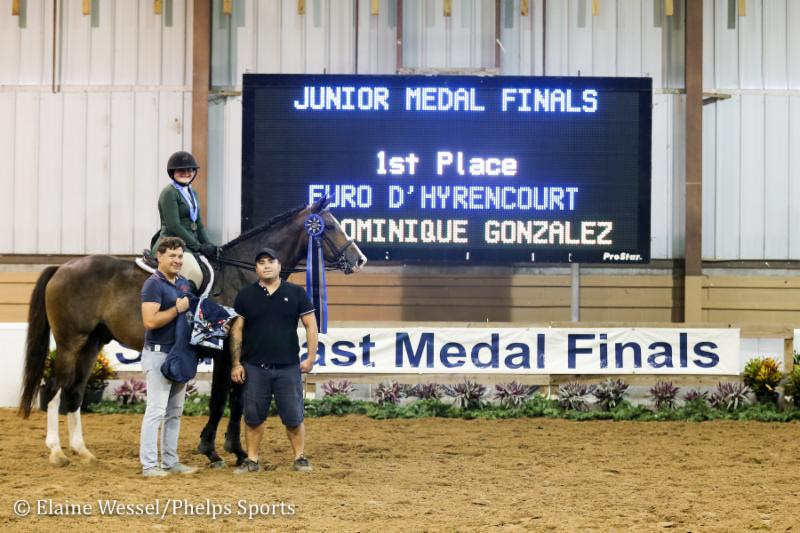 Our own resident photographer and top notch interviewer Dominique Gonzalez scored some tricolor glory of her own this past weekend when she won the Junior Medal Final at the Southeast Medal Finals under the bright lights of the Bob Thomas Equestrian Center. She and Euro D’Hyrencourt won the over-fences test and were third in the Under Saddle to head to the finals on Sunday. For the final course, riders had to face an intimidating technical trip around the ring that required handiness and adjustability. Dominique and “Euro” –a seven-year-old warmblood gelding owned by Wadsworth Equestrian — put up an indomitable 86, outscoring her next closest competitor by seven points. For the final test, the top riders were brought back to do a flat class without stirrups, and Euro and Dominique sailed through to keep their lead and win the overall Junior Medal Final. It was a sweet moment for Dominique, who has been runner-up in this class previously, making the win all the more meaningful. Reserve Champion went to Lauren Bramley aboard Irresistible, and the yellow ribbon went to Raegan Landrum aboard Contano. She was also on the winning team for the equitation challenge, and she took third overall in the Southeast Medal Finals Junior Jumper division aboard Semi-Automatic C (“Jento”), an eight-year-old Belgian Warmblood gelding owned by her family’s farm, T.M. Hills International. Congratulations to Dominique, TM Hills and their team, and of course to all the riders competing at the Southeast Medal Final! Full Results from Southeast Medal Final Here.